During the past year, CrowdTangle has started being used for analysis and research by many actors within Sweden’s media landscape. For example, Aftonbladet has run articles on the impact of social media on politics and political parties based on searches in CrowdTangle (e.g. “Sweden Democrats outclass all other parties on social media”, “How party leaders have fared on social media – after the elections and The media lost the duel between Löfven and Åkesson”). SVT conducted a survey on election issues based on CrowdTangle. At Swedish Radio too, we used the tool to see which statements by politicians are spread the most widely on social media, in our fact-checking project Faktiskt. In CrowdTangle, you can easily put together lists to monitor politics, topics and issues or geographical areas (under the tab Dashboards). In a list, you can rapidly find posts on social media that stand out from the crowd – posts that many people reacted to or that are shared many times. One concrete way to use the tool is to filter posts from the last 24 hours every morning. 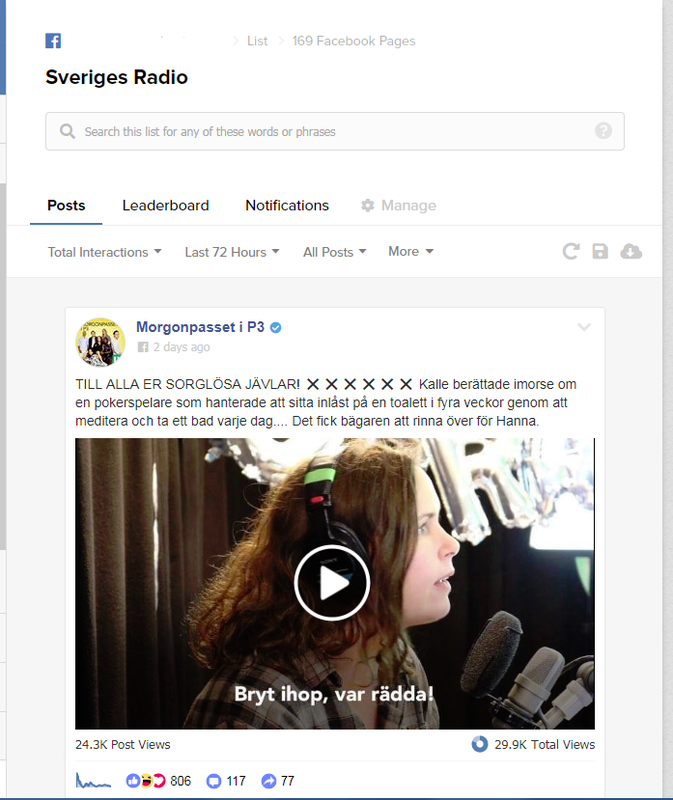 Below is an example of a sorted list created with some of Swedish Radio’s Facebook pages. Once you have created a list and added the pages that you want to monitor, you can sort these in different ways. You can sort them based on total interactions, on whether they are overperforming or underperforming (in relation to the average for the page) or sort by the most recent posts. You can also set a time period (in the example above, you can see that it is set to the last 72 hours). In addition, you can choose what kind of content you want to focus on (posts with images, videos, links, etc). 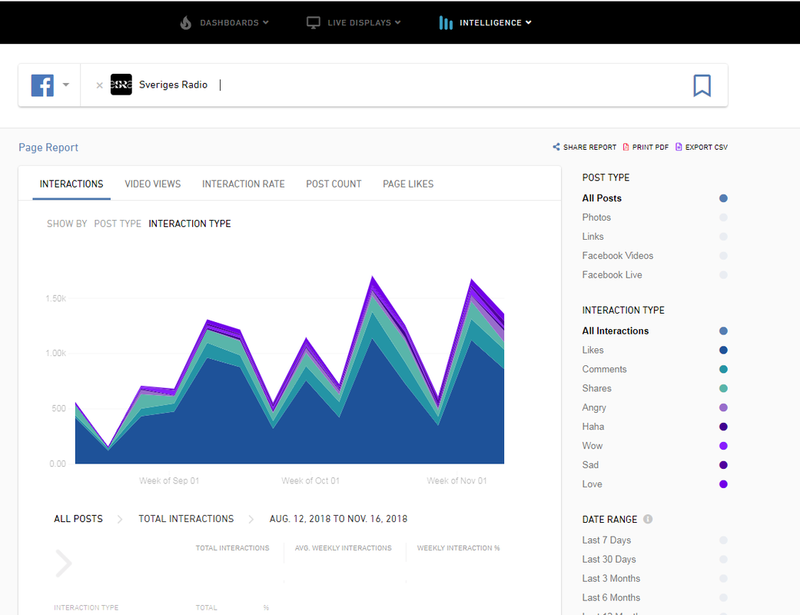 CrowdTangle also makes it easier for newsrooms/departments to work with statistics on social media. Under the Intelligence tab, you can extract data to learn more about how your journalism is working on Instagram, Facebook, Twitter and Reddit. Here, you can view how a social media account is performing in terms of the number of interactions and video views, your Interaction Rate (number of interactions divided by the number of followers of the account/page at the time of measurement), the Post Count over a period of time, or the trend in the number of Page likes/Followers over a period of time. You can display the lists by post type and time period (see below). You can even compare the statistics for different accounts by lining them up next to each other, for example to compare with competitors, or to see how the strategy behind your own accounts is working. One account might focus on links, while another focuses on a visual narrative in the form of still images or video – which does the audience like? What kinds of reactions is the content getting? Does the timing of posts make any difference? You can also download these statistics in neat PDF reports directly in CrowdTangle. 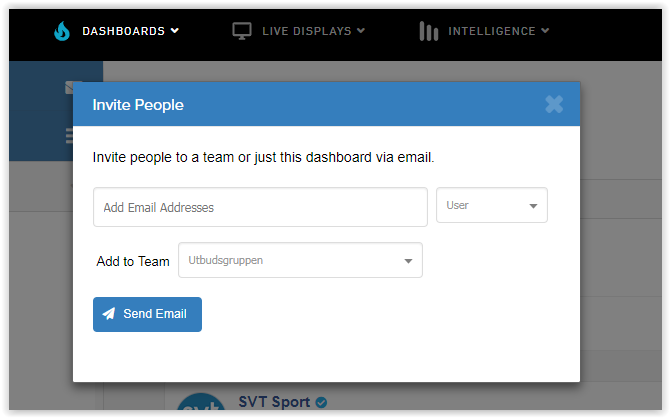 It is easy for newsrooms/departments to collaborate in CrowdTangle, working in parallel or together in your Dashboards. 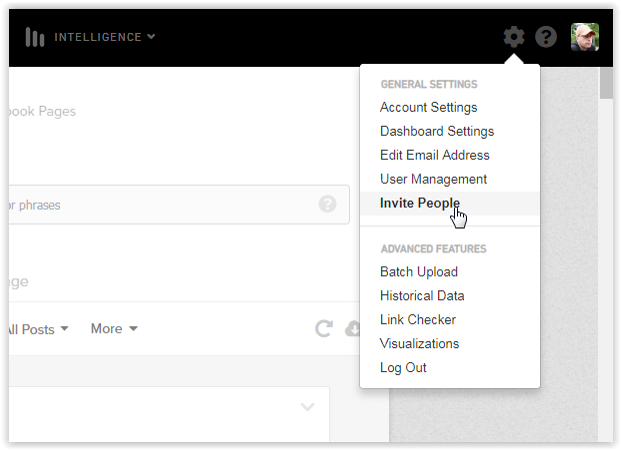 The Team Owner invites other co-workers to join by clicking on the General Settings icon in the upper right corner of the screen and selecting Invite People. The invitation is sent by e-mail to the new user and since CrowdTangle is linked to Facebook, the user needs to be logged in to Facebook to be able to use the tool (and it works much better in Chrome than in Internet Explorer).